Kingdom Wars is a real time strategy-based game that puts you in control of an army that must face a rival evil army. 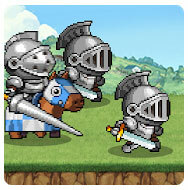 The battles take place inside 2D settings where each army is placed on either side of the screen. With each passing second you’ll receive a small amount of cereal that you can either use to recruit more soldiers or to increase your cereal production. The key here is to create a balance between increasing your cereal production and recruiting the soldiers that’ll defend your castle. Using this strategy is the only way to get rid of your enemy’s castle.